DFM dynamic winnowing mill makes the energy utilization of primary crushing much higher than the energy utilization of final grinding, so “more crushing and less grinding” can be realized. In the fabrication processing, it emphasizes to screen out the particles meeting the grinding requirements and keep those not meeting grinding requirements in the winnowing mill for crush until up to standard when the pre-grinding within DFM winnowing mill. Adopting winnowing principle when fine powder materials discharging, about 40% fine powder materials ascend along with the airflow. After reclassification via MSC high efficiency dynamic powder selector, the materials meeting end-product requirement will enter the efficient dust collector for collection along with airflow, and the collection volume is about 20%. Because DFM dynamic winnowing mill adopts steel ball crushing for grinding, material particles have good appearance, which means the materials collected by dust collector can totally be used as finished products. 1. Investment saving. In the construction of one million tons/year cement grinding station, for example, system design adopts two sets DFM dynamic winnowing mill production lines matched with WS cement ball mills that can run in parallel connection. The investment of two production lines are about 25 million, saving over 20 million compared with the same scale cement grinding station with roller press. 2.Small system power configuration. Still using the construction of one million tons/year cement grinding station as an example, just 5000KW power configuration can meet the requirement, and the power consumption of cement system is only 26KW/h. 3.High unit-hour output. Taking 3.2m*13m mill as example, using the new grinding technology of DFM dynamic winnowing mill, the unit-hour output of mill is 85-95t, the specific surface area is above 360m3/kg and the fineness is below 2%. 4.High operation rate and low maintenance cost. The new-type cement grinding station, comprised of DFM dynamic winnowing mill, MSC powder selecting machine and WS high-yield cement mill, has mature and reliable system technology and hardly any maintenance, greatly improving the operation rate of equipment. 5.Cement with good performance and high clinker use ratio. 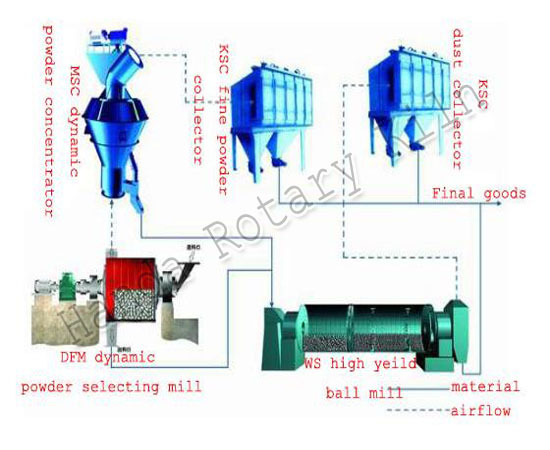 With DFM dynamic winnowing mill, system adopts open grinding technology, which makes cement particles wide size distribution, good bulk density and high cement strength. Because the average clinker particle size through open grinding is small and the hydration rate is fast, the same cement strength can use less clinker, improving the mixture contents.